NSK Ltd. (NSK; Headquarters: Tokyo, Japan; President and CEO: Toshihiro Uchiyama) has published a new instructional video showing how to replace wheel hub unit bearings with magnetic encoders. The video, first shown at Automechanika Frankfurt, is available on YouTube today. 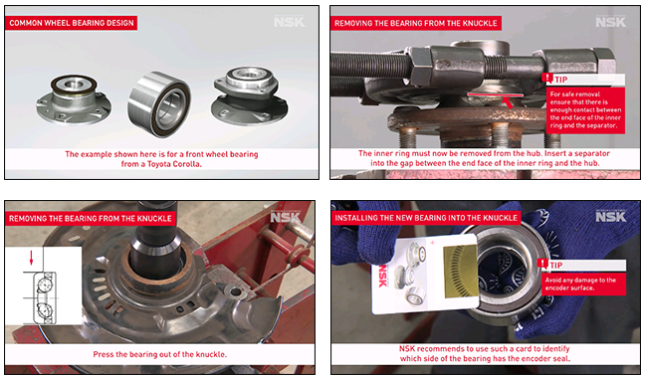 Since 2017 NSK has been producing a series of how-to videos covering replacement and installation of hub bearings (HUB I), linear guides, and ball screws. Customer feedback has been highly positive, and the videos have garnered many views, so we are happy to announce the release of another video in the series. This video features NSK's first-generation hub unit bearing (HUB I), which is widely used in passenger vehicles around the world. In recent years, increasing adoption of anti-lock braking systems* (ABS) in both large and small vehicles has contributed to improved automotive safety. HUB I with magnetic encoder works with ABS sensors attached to the vehicle body. The encoder is embedded in the bearing seal on just one side of the bearing, so incorrect mounting results in ABS not being able to function. The mounting procedure is complex and the bearings must be handled appropriately to avoid damaging the encoder, and it is also difficult to determine which side of the hub bearing has the encoder from external appearance alone. 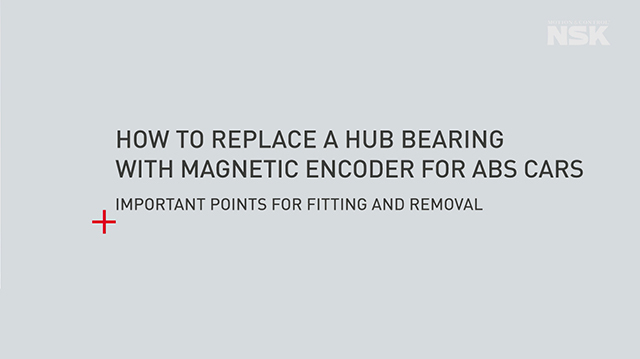 To avoid such issues, and to safely and properly replace hub bearings with magnetic encoders, NSK's video demonstrates the replacement procedure step by step, including how to use a magnetic field viewer to correctly verify the encoder side of the bearing. The video also features many little tips and tricks that may prove useful when replacing hub bearings. * Anti-lock braking systems (ABS) detect vehicle speed and turning direction and automatically control the brakes to prevent wheels from completely locking up, thereby enabling better vehicle control while braking.